We know it's April Fools, but we're not joking around! Today and tomorrow, get free standard shipping on all domestic accessory orders. Make sure you select the free shipping option when you check out! Happy spring from all of us at MMI! We are excited to announce our 3rd Annual Clarinet Day at MMI! April 13, 2019 from 10am-5pm. Jonathan Gunn -clarinet professor from University of Texas - Austin, will be our featured guest artist. Jonathan will performing a small recital and giving a master class event. - Participants will be selected based on repertoire and age. 4 performers will be selected by the artist; all decisions are final. - Submissions can be made through the link below or by emailing your name, age, contract information and selected repertoire to tori@mmimports.com by EXTENDED DATE April 1, 2019 5:00pm. § 1st place = $500 cash prize and invitation to attend Buffet's Clarinet Academy in July! Submissions can be made through the link below or by emailing tori@mmimports.com with your name, contact information and repertoire. Free small repairs throughout the day and a small lunch will be provided. 3. Entrants must supply 1 copy of their music for the judges. 4. Proper performance attire is expected. 5. Limit of 20 entrants per division allowed. Therefore performers are selected on a first come, first served basis. A wait list will be created in the event of cancellations. Reduced Pricing on Many New Selmer Saxophones for 2019! We're happy to report that Selmer has greatly reduced the pricing on many of their professional model saxophones which means big savings for our customers. Please have a look below at the 2018 pricing vs. the reduced 2019 pricing and contact our saxophone specialist Brandon at brandon@mmimports.com with any questions. Was $6,629.00 - Now $5,759.00! Was $6,759.00 - Now $5,599.00! Was $8,029.00 - Now $6,509.00! Was $7,859.00 - Now $6,849.00! Was $13,959.00 - Now $12,269.00! Was $7,549.00 - Now $6,439.00! Was $8,539.00 - Now $7,369.00! Was $15,329.00 - Now $13,439.00! Was $7,959.00 - Now $6,869.00! Was $9,429.00 - Now $8,579.00! Was $9429.00 - Now $8,579.00! Was $3,599.00 - Now $3,349.00! Was $7,259.00 - Now $6,579.00! Was $7,569.00 - Now $7,069.00! Was $14,529.00 - Now $14,189.00! Was $7,159.00 - Now $6,759.00! Was $7,459.00 - Now $6,799.00! Was $8,359.00 - Now $7,909.00! Was $8,359.00 - Now $8,049.00! Was $8,859.00 - Now $8,499.00! Was $8,159.00 - Now $7,609.00! Was $8,159.00 - Now $7,489.00! Was $8,359.00 - Now $7,969.00! Was $17,129.00 - Now $15,679.00! Was $17,129.00 - Now $15,939.00! Was $8,679.00 - Now $7,709.00! Was $8,679.00 - Now $7,599.00! Was $8,959.00 - Now $7,709.00! Was $9,129.00 - Now $8,739.00! Was $9,129.00 - Now $8,589.00! Jan. 4th--Normal Business hours resume. Thank you for your patience and understanding during this very busy end of year! As a reminder, our online store is always open for your shopping needs! We hope you have a wonderful holiday season and we wish you much peace, joy, and success in 2019!! Best wishes from all of us at Midwest Musical Imports! We are sad to announce that bassoon specialist Katie Bauernfeind's last day is today. Please join us in wishing Katie the best in her new adventures, she will be greatly missed! December 19th will be my last day at MMI. It has been an honor and a privilege to work with the outstanding customers and vendors at MMI. I have always been impressed by the kindness, generosity, and dedication of the incredibly talented musicians we serve. I am very grateful that I have been able to work with each of you. Leaving MMI was not an easy decision, but it is time for me to start a new adventure. I wish all of you the best of luck in your future endeavors. May every day be a good reed day! Not sure what to buy for the Oboist on your holiday shopping list? Don't worry! We've put together a list of ideas at all price levels! Call us if you would like more assistance, we are happy to help! Not sure what to buy for the Bassoonist on your holiday shopping list? Don't worry! We've put together a list of ideas at all price levels! Call us if you would like more assistance, we are happy to help! 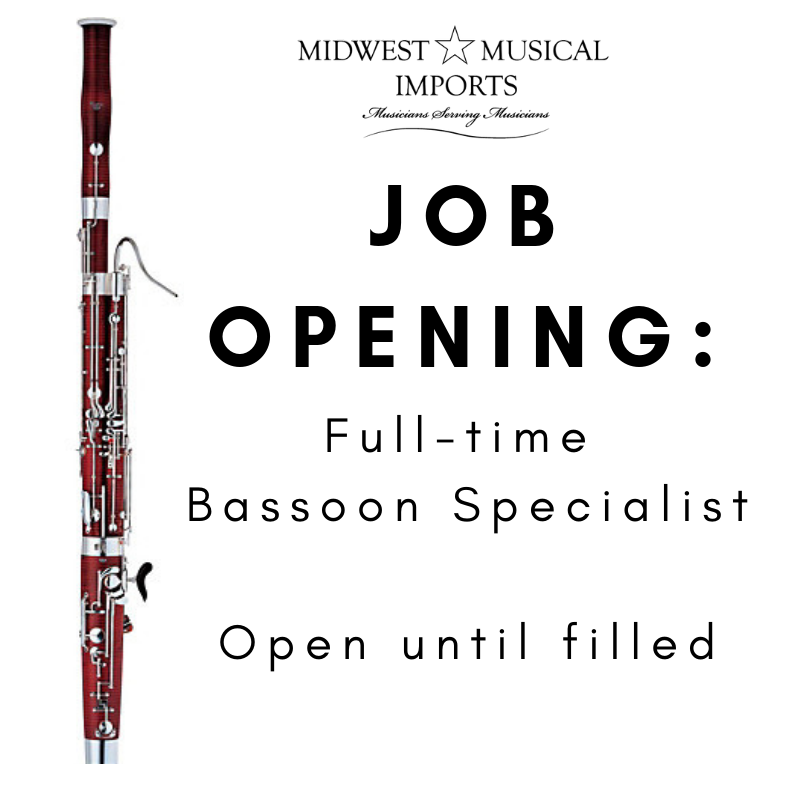 Midwest Musical Imports is looking for a full-time bassoon specialist. Qualified candidates should have a degree in bassoon. Must possess excellent customer service and computer skills. Occasional travel will be required. Duties include: assisting customers, play-testing bassoons, bassoon and bassoon bocal sales, accessory purchasing/ordering/fulfillment, web site updates, answering phones/emails, and other duties as assigned. Benefits include: competitive pay (we do not work on commission), bonuses, paid vacation, paid holidays, retirement plan, generous employee discounts. Pay is commensurate with experience. This is an hourly position. Current store hours are: Monday and Thursday 9-7, Tuesday, Wednesday, & Friday 9-5, and Saturday from 9-3. Schedule may be flexible. Location is in Minneapolis, MN. Please send a resume and cover letter via email to: Jessica@mmimports.com Position is open until filled. 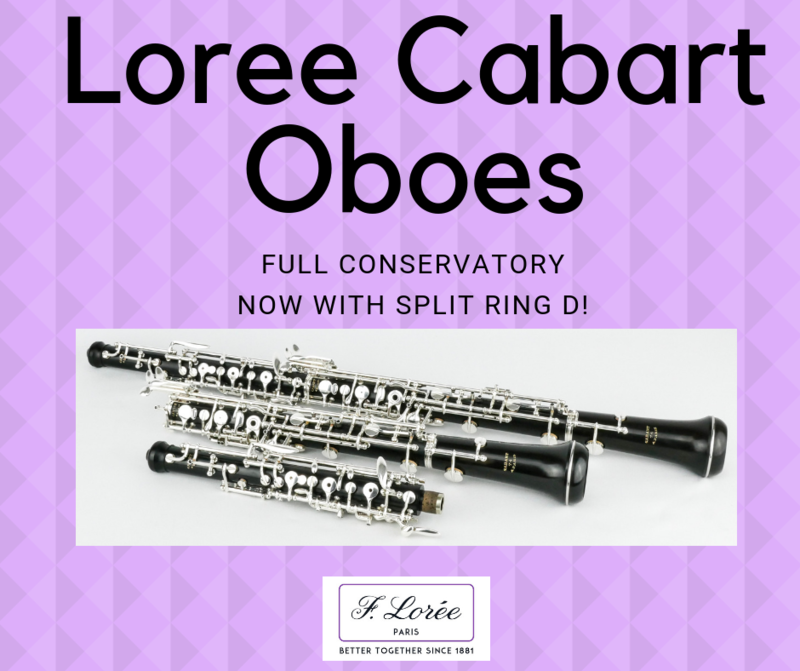 New, Full conservatory Loree Cabart oboes! Introducing the new, Full conservatory Loree Cabart oboes! These instruments have long been sought after as the top of the line intermediate level oboe. 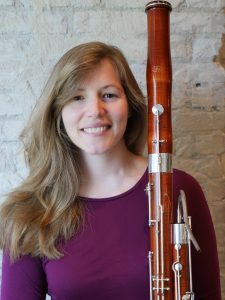 Finally, with the addition of the Split-D ring key on the right hand, we have an introductory professional Loree oboe for students and professionals alike! Call us today to set up a trial! Happy Thanksgiving! Savings and free shipping! This weekend, we will be CLOSED Thurs. and Fri. 11/22 &11/23 so our employees can enjoy time with their families during Thanksgiving. Join us for SMALL BUSINESS SATURDAY with special in-store only deals from 9am to 3pm. ONLINE ONLY! 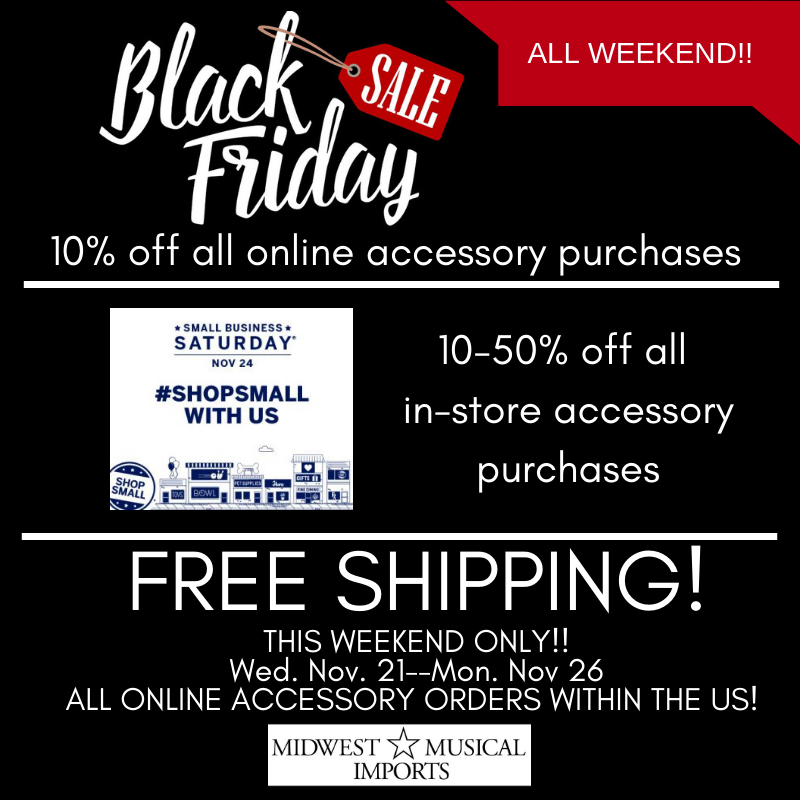 Save 10% on all accessory orders all weekend--use code HOLIDAY2018 at the checkout. Free shipping on all online orders all weekend long! 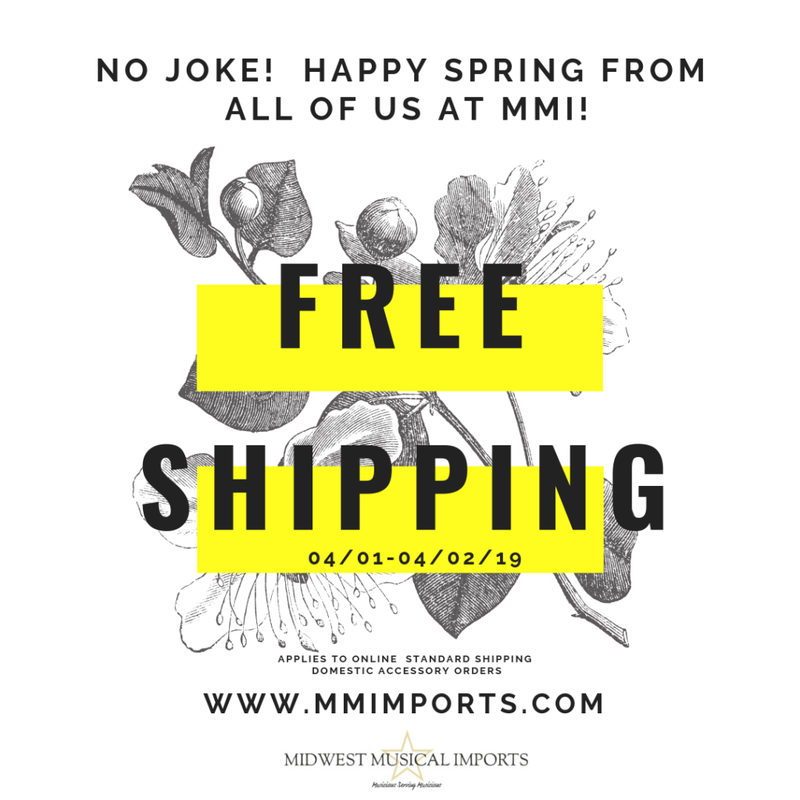 We are grateful for you, our customers, and wish you a wonderful holiday weekend from all of us at Midwest Musical Imports! We have new hours!! We are now open Monday and Thursday evenings until 7pm. Thanks so much and we hope to see you soon! Event is free and no registration required! Free repairs, food, and instrument trials all day! All levels of clarinetists (and parents & band directors) welcome! STUDENTS--Win one of two student only prizes--a Buffet Prodige clarinet or a $250 clarinet scholarship! accessories, vendor swag and more! Free small repairs during the event! A light lunch will be served during the lunch seminar. A HUGE variety of clarinets from Buffet, Selmer, and Yamaha will be available for testing all day! your music stand and your clarinet! Click here to share this event on Facebook! Looking forward to seeing you on Saturday! !